The elections are about one week away. Steve Vaughn posted his “Ten things that are plucking my last nerve”, his thoughts on the irritating things of this election season. I thought I would add to that my list of irritating things about debates. 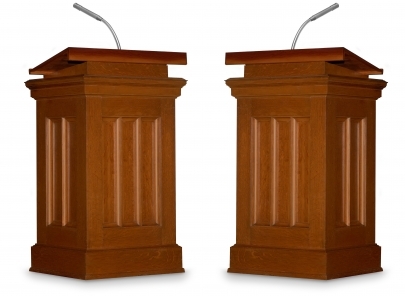 First, if you are a candidate and have agreed to do a debate with whatever organization then SHOW UP. It takes a lot of effort to pull debates together including working with everyone’s schedules, finding a location and getting people there. Candidates not showing up just lets you know how little they think about those voters. Second, if you are an organization do not tell the audience a candidate did not show up when you did not put in the work to make it a valid debate. That means you have to do more then send out an email saying “our debate is this Friday.” As an organizer you should have had actual contact , either by phone or email, with the campaign and invited them. If there was a conflict then the audience should be told that. Third, if you are having a forum or “meet the candidates” where candidates from multiple races are attending, invite all the candidates in your areas races. This happened at a forum I attended. I wondered why one district race in the local area was absent when candidates from areas farther away attended. Did they have another event? So I asked both the candidates in that race at their next event to find out that neither the Republican or Democrat in the area had been invited. The group hosting the event said nothing about it which left the audience to infer that neither candidate cared enough to show up. Lastly, a major item that plucks my last nerve: if a candidate is not showing up they should not send someone to stand in for them. I am not voting for someone’s campaign manager so why do I care what their opinion is about an issue. Also, the candidate does not really know what the person will say. Do they want to risk losing voters to the their challenger if their stand-in speaks inappropriately about issues? This happened in a debate on the Peninsula recently. The question asked was if the Seventeenth Amendment to the United States Constitution, which established direct election of United States Senators by popular vote, should be overturned. The person filling in for the actual candidate said yes because the public is obviously doing a bad job and it should be left up to the Virginia General Assembly to appoint their Federal Senators. So I might have taken more offense to this then others as I am a president of a local chapter of the League of Women Voters and it took us more than 90 years to be able to vote in the first place. However, I think any voter who cares enough to turn out to a debate and get information to make an informed decision should also be offended. Nothing like being told you are too stupid to make a good decision so your decisions will be made for you. Carole, having covered a couple of league debates this cycle, I have to say the one thing that gets on my nerves is that, after the moderator asks some well-thought out questions having to do with actual issues, the questions from the audience always include at least a couple obviously planted by political operative from one side or the other addressing whatever “gotcha” angle the campaign is currently pursuing. Well I think you are going to always get those as a lot of the people who show up for debates are working for a candidate. The best you can do is try to weed them out but some always seem to slip through. We almost got caught with one of those in our debate this year. A question where the question sorters did not know what the writer was talking about. It got submitted in various forms by about 5 people. Plus it did not seem to be an issue the General Assembly would be looking at. Turns out in a couple days the other campaign came out pushing it as their “gatcha” issue. Then it turned out to be inaccurate anyway. I think though that public questions are important in our local and state races because people tend , from what I have seen, to come and be more involved if they are part of the process. It is really hard getting people out to vote for these election a lot of times. But you get a lot of inappropriate questions. I think the main one we got in all our debates was “who will you vote for for president in 2011” . Not only does that not relate to their office that is their personal business if they want to endorse someone they can do it another time. Oh and also sometimes the candidates pretend its gatcha questions not to answer. I ask a question as a voter in my district. The candidate inferred that it was a planted question. Afterwards I went up and told the candidate it was a valid question and wanted to know the answer. He just said well a lot of questions like that are planted questions. My question, for the record, was what was their stance if a state should be able to opt out of a federal mandate. Then based on this answer do they feel the localities should be able to opt our of state mandates. I though it was a valid question.